for 338 Days to Date. On page 24 of Mystery Scene Magazine issue #142 is a list of intriquing first lines taken from recent mystery novels, including the opening lines of Kathleen's sixth Chloe Ellefson mystery, Death On The Prairie: "The quilt belonged to who?" Chloe Ellefson's voice squeaked on the last word. "Did you say...Laura Ingalls Wilder?" Yesterday demand for 3 of Kathleen's Caroline books boosted them into the Top 1% of all US printed book sales—out of 8 million books tracked. Source: Nielsen BookScan. 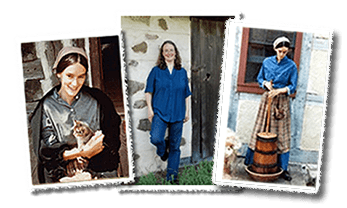 Last night Kathleen's A Settler's Year: Pioneer Life Through The Seasons presentation was broadcast on C-SPAN3 American History TV. It was originally recorded on October 19th at the National Archives in Washington, DC, where Kathleen was the guest speaker at their Noon Lecture series. An archived copy of her talk can be viewed by clicking HERE. From 1-4 PM this Saturday, November 28th Kathleen will be at the Janke Book Store in Wausau, WI, talking with readers and signing her two newest books, Death on the Prairie, the just released sixth Chloe Ellefson mystery from Midnight Ink Books, and her new nonfiction pioneer history, A Settler's Year, from the Wisconsin Historical Society Press. Please join Kathleen at Wisconsin's oldest bookstore (est. 1919) on Small Business Saturday! And the winners are: Patty Colllins, Theresa Echols Haack, Nancy Gielow Hawkins, Amy Laundrie, Mary Luchsinger, and Audrey Tollefson. Each will receive a free printed Chloe Ellefson mystery book of their choice, signed and personalized by the author. Kathleen thanks everyone who entered; may each of you find blessings to be grateful for. As of yesterday visitors to Kathleen's Facebook Author page have given it 1,600 Likes. Thank you! To thank her readers for the wonderful support they have shown for Death On The Prairie, the sixth Chloe Ellefson mystery, Kathleen is holding a gratitude giveaway. Six lucky readers will each receive a free, signed and personalized Chloe book of their choice. To enter, leave a comment on Kathleen's Facebook Author page or Sites and Stories blog before Midnight, Monday, November 23rd. Winners will be announced the next day. Good Luck to everyone! 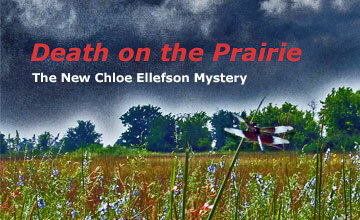 This Tuesday at 11 AM Kathleen will be speaking with host Larry Meiller and his listeners about her new Chloe Ellefson mystery, Death On The Prairie, on his popular statewide radio program. Click the right facing arrow below to listen. Kathleen's latest newsletter went out today, with updates about her new Chloe Ellefson mystery, awards for her A Settler's Year nonfiction history book, and where to get copies of her Caroline American Girl books. Read the newsletter by clicking HERE. As of yesterday visitors to Kathleen's Facebook Author page have given it 1,500 Likes. Thank you! Yesterday demand for Kathleen's 3 newest books boosted them into the Top 1% of all US printed book sales—out of 8 million books tracked. Source: Nielsen BookScan. Kathleen will be joining Jerry Apps, Patty Loew, Michael Perry, and other popular Wisconsin authors this Saturday when she gives her illustrated A Settler's Year: Pioneer Life Through The Seasons program at the Sterling North Book & Film Festival in Edgerton, WI. Kathleen's program starts at 11:15 AM and at 1:15 PM and is free and open to the public. Download a copy of the festival schedule by clicking HERE. Kathleen and her feline muse, Sophie the Sophisticat, are back home after their week-long writing retreat. Sophie is shown helping edit a draft of the seventh book in Kathleen's award-winning Chloe Ellefson Historic Sites mystery series (contracted for release in fall 2016). Mr. Ernst is very happy to have them home. Now that the sixth Chloe Ellefson mystery, Death on the Prairie, has been released, Kathleen is off to an undisclosed location where she and her feline companion and muse Sophie will spend a week working on Chloe 7, which is contracted for release in fall 2016. Kathleen's husband (AKA 'Mr. Ernst') has remained behind to keep the home office open. Kathleen is giving away a free, signed and personalized printed copy of her sixth Chloe Ellefson mystery on the Libri Amori Miei blog. The giveaway runs through October 30, 2015. To enter, leave a comment at the bottom of the post by clicking HERE. Today Kathleen will present her popular American Girl Fans and Chloe Ellefson Mysteries illustrated programs at the public library in Poynette, WI. From 3:45-4:45 PM she will share how she wrote 19 books for American Girl. Then from 6:30-7:30 PM she will discuss her award-winning Wisconsin-based Chloe Ellefson mysteries—including the just released sixth book, Death On The Prairie, about the life, books, and homes of Laura Ingalls Wilder. Kathleen is giving away a free, signed and personalized printed copy of her sixth Chloe Ellefson mystery on Melinda's Book Blog. To enter, read the review and send Melinda an email by clicking HERE. Kathleen is giving away a free, signed and personalized printed copy of her sixth Chloe Ellefson mystery on the Back Porchervations blog. The giveaway runs through October 26, 2015. To enter, leave a comment on the blog by clicking HERE. Today Kathleen gave an illustrated talk about her nonfiction history book, A Settler's Year, at the National Archives in Washington DC as part of its distinguished Noon Lecture series. Watch the talk by clicking HERE. Kathleen spent today talkng and riding along with officers of the Village of Eagle Police. One of the main characters in her Chloe Ellefson mystery series, Roelke McKenna, is a patrol cop with the EPD. Kathleen has relied extensively on the Eagle police (and others) for help in making Officer McKenna, the police work he does, and the mysteries that he gets involved in, as accurate as possible. Our thanks to the men and women of the EPD! Kathleen is giving away a free, signed and personalized printed copy of her sixth Chloe Ellefson mystery on Lori's Reading Corner blog. The giveaway runs through October 31, 2015. To enter, leave a comment at the bottom of the post by clicking HERE. The US National Archives is flying Kathleen to Washington DC to do an illustrated talk about her new nonfiction history book, A Settler's Year: Pioneer Life Through The Seasons as part of their Noon Lecture series. Kathleen's program takes place this Monday, October 19th, from Noon to 1 PM Eastern time (11 AM to Noon Central) and will be streamed live over the Internet for everyone to see. For details, click HERE. Kathleen is giving away a free, signed and personalized printed copy of her sixth Chloe Ellefson mystery on the View From the Birdhouse blog. The giveaway runs through October 23, 2015. To enter, leave a comment at the bottom of the post by clicking HERE. From 7-8 PM this evening at Books & Company in Oconomowoc, WI, Kathleen will be talking with readers and signing her two newest books, Death on the Prairie, the just released sixth Chloe Ellefson mystery from Midnight Ink Books, and her new nonfiction pioneer history, A Settler's Year, from the Wisconsin Historical Society Press. Kathleen is giving away a free, signed and personalized printed copy of her sixth Chloe Ellefson mystery on the Storeybook Reviews blog. The giveaway runs through October 16, 2015. To enter, leave a comment at the bottom of the post by clicking HERE. Kathleen is giving away a free, signed and personalized printed copy of her sixth Chloe Ellefson mystery on the Christa Reads and Writes blog. The giveaway runs through October 21, 2015. To enter, leave a comment at the bottom of the post by clicking HERE. Kathleen is giving away a free, signed and personalized printed copy of her sixth Chloe Ellefson mystery on the Laura's Interests book blog. The giveaway runs through October 21, 2015. To enter, leave a comment at the bottom of the post by clicking HERE. Kathleen will be hosting the official Death on the Prairie release party from 6:30-7:30 PM this evening at HotelRED, at the corner of Monroe and Regent Streets in Madison, WI. She will be greeting readers, talking with Doug Moe, answering audience questions, and signing books. (Expect door prizes and a book-themed cake too.) It's sponsored by Mystery To Me, which will be there selling all six Chloe Ellefson mysteries. The event is free, open to the public, and the hotel has free parking. For additional details call (608) 283-9332. Kathleen is giving away a free, signed and personalized printed copy of her sixth Chloe Ellefson mystery on the Escape With Dollycas Into A Good Book blog. The giveaway runs through October 21, 2015. To enter, fill out the form by clicking HERE. Kathleen has been invited to appear on the "News 3 This Morning" program broadcast by Madison, Wisconsin-based WISC-TV / Channel 3000.com. She wil be interviewed starting at 6:45 AM tomorrow, Wednesday, October 7th about Death on the Prairie, her newest Chloe Ellefson mystery book, and the book's Madison release party that evening. Kathleen's publishers report that as of the end of June 2015, a total of 1.6 million printed, e-book, and audio copies of her books have been purchased. Released at the end of February, Kathleen's nineteen American Girl historical fiction novel, The Smuggler's Secrets: A Caroline Mystery, has now been ranked in the Top 1% of US printed book sales—out of 8 million books tracked—for 150 days (pre- and post-release). Source: Nielsen BookScan. Kathleen spent yesterday outside talking with readers and signing copies of her books at the festival in the lovely resort town of Fish Creek, WI. Thanks to special arrangements made by The Peninsula Bookman and publisher Midnight Ink Books, readers were able to acquire printed copies of her not-yet-released sixth Chloe Ellefson mystery, Death on the Prairie. Kathleen will be speaking about and signing copies of her Chloe Ellefson mysteries tonight at the Mill City Museum in Minneapolis. The fifth Chloe book, Tradition of Deceit, is set there, and the museum will briefly open the turnhead distributor room (normally closed to the public) so attendees can see where several key scenes in the book take place. In an article entitled Wisconsin Pioneers, reviewer Jay Rath wrote in today's Madison, Wisconsin-based Isthmus newspaper that Kathleen's book, A Settler's Year: Pioneer Life Through The Seasons, serves well "as an accompaniment to [Laura] Ingalls Wilder's first published book, Little House In The Big Woods." Kathleen's A Settler's Year: Pioneer Life Through The Seasons is currently the bestselling book in the 2015 Fall catalog of the Wisconsin Historical Society Press. On a near perfect fall afternoon, Kathleen and photographer Loyd Heath were at Old World Wisconsin, where Loyd took the book's beautiful images, to celebrate the release of A Settler's Year: Pioneer Life Through The Seasons. The crowd included the family of Marty Perkins, who first conceptualized the book, as well as Director Dan Freas of Old World, and the book's publisher, Kathy Borkowski of the Wisconsin Historical Society Press. Noon today saw Kathleen at the Waukesha Public Library doing her first illustrated talk about her newest non-fiction book, A Settler's Year: Pioneer Life Through The Seasons. Her well attended program was sponsored by the Wisconsin Historical Society. Thunderstorms dumping heavy rain outside did not dampen the enthusiasm of the intrepid readers inside celebrating the release of Kathleen's 32nd book, A Settler's Year: Pioneer Life Through The Seasons. Tonight's event was held at Mystery To Me Bookstore where popular Wisconsin columnist (and author) Doug Moe talked with Kathleen about the roots of new newest non-fiction book, and her writing career. Kathleen talks A Settler's Year: Pioneer Life Through The Seasons with Mitch Teich of Milwaukee Public Radio's Lake Effect program. Click on the right-facing arrow below to listen. Summer is over and kids are back in school—time for the official launch of Kathleen's newest non-fiction book: A Settler's Year: Pioneer Life Through The Seasons. There are three launch events in Wisconsin this week—in Madison, Waukesha, and at Old World Wisconsin. For details, click HERE. Today Kathleen spoke with host Larry Meiller and his listeners about her new non-fiction history, A Settler's Year: Pioneer Life Through The Seasons, on his popular statewide radio program. Click the right facing arrow below to listen. The National Archives has invited Kathleen to speak about her new non-fiction history book, A Settler's Year: Pioneer Life Through The Seasons, as part of their Noon Lecture series. She wil be speaking and signing copies on October 19th at the National Archives Museum, adjacent to the National Mall in Washington, DC. Her presentation will be free and open to the public, as well as live-streamed and posted on YouTube. Additional details TBA. Kathleen's newsletter went out today, with updates about her Caroline American Girl books going out of print, and how her two new books—A Settler's Year and Death on the Prairie—reflect long-held dreams coming true. Read the newsletter by clicking HERE. Hardcover copies of Kathleen's A Settler's Year: Pioneer Life Through The Seasons are now available for delivery via the Amazon.com website. Readers who pre-ordered the book from Amazon should be receiving them soon. Initial demand for hardcover copies of Kathleen's A Settler's Year: Pioneer Life Through The Seasons has been so great that the Barnes & Noble website is reporting they are temporarily out of stock online. Never fear, additional copies should be arriving shortly! 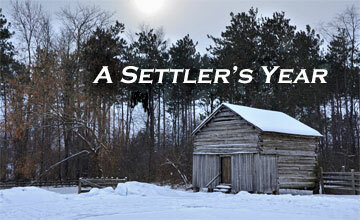 Hardcover copies of Kathleen's A Settler's Year: Pioneer Life Through The Seasons are now available for delivery via the Books-A-Million website. Readers who pre-ordered the book from BAM should be receiving them soon. Kathleen will be giving away 3 signed and personalized hardcover copies of her newest book: A Settler's Year: Pioneer Life Through The Seasons. To enter the giveaway, leave a comment before Midnight, Sunday, August 9th on her Facebook Author page. Kathleen's A Settler's Year: Pioneer Life Through The Seasons, (richly illustrated by photographer by Loyd Heath, and published by the Wisconsin Historical Society Press) is now available for downloading from the Apple iTunes Store for reading with iBooks on the iPad, iPhone, iPod touch, or Mac. Today Kathleen is in Eau Claire WI signing her newly released non-fiction history book, A Settler's Year: Pioneer Life Through The Seasons, and her Chloe Ellefson mysteries at the Tre Lag Stevne, an annual conference of three Norwegian-American immigrant associations: Gudbrandsdal, Nord Hedmark og Hedemarken, and Trønderlag of America. Kathleen's A Settler's Year: Pioneer Life Through The Seasons, (richly illustrated by photographer by Loyd Heath, and published by the Wisconsin Historical Society Press) is now available for reading with the Amazon Kindle apps and e-readers. Kathleen's A Settler's Year: Pioneer Life Through The Seasons, (richly illustrated by photographer by Loyd Heath, and published by the Wisconsin Historical Society Press) is now available as an Adobe ePUB eBook on Google Play. Kathleen's A Settler's Year: Pioneer Life Through The Seasons, (richly illustrated by photographer by Loyd Heath, and published by the Wisconsin Historical Society Press) is now available as an Adobe ePUB eBook from the Kobo website. Kathleen's A Settler's Year: Pioneer Life Through The Seasons, (richly illustrated by photographer by Loyd Heath, and published by the Wisconsin Historical Society Press) is now available for reading with the Barnes & Noble Nook apps and e-readers. Kathleen's new non-fiction book A Settler’s Year: Pioneer Life through the Seasons is Wisconsin's selection for the Library of Congress 52 Great Reads list "representing the literary heritage of the 50 states, the District of Columbia and the U.S. Virgin Islands." Intended as a resource for students and teachers, the annual list is created for distribution at the National Book Festival in Washington, DC. To download a copy, click HERE. Congratulations to the ten winners of yesterday's Ten Book Tuesday Giveaway: Alexis Amelotte, Suzan Morrow Farrell, Joeylynn Mattson, Laurie Millar Hanley, Marianne Morris, Ruth Paulson, Barbara Pattow-Vigil, Lola Pudding, Jessica Schmitz, and Sally Wood! The giveaway was held to celebrate the posting of a page on Kathleen's website with lots of details about her next Chloe Ellefson Historic Sites mystery, Death on the Prairie. On the second day of this busy Laura Ingalls Wilder conference Kathleen met and heard presentations by authors John E. Miller (left) and William Anderson (right), who have each written numerous books about the beloved children's author. Yesterday demand for Kathleen's Caroline American Girl books boosted two of them into the Top 1% of US printed book sales, out of 8 million books tracked. Source: Nielsen BookScan. Yesterday demand for Kathleen's Chloe Ellefson mysteries boosted two of them into the Top 1% of US printed book sales, out of 8 million books tracked. Source: Nielsen BookScan. Here's a photo taken a few years ago of "Mr. Ernst" in his 'Keeper's uniform raising the flag at Pottawatomie Lighthouse on Rock Island. Rock and nearby Washington Island are the settings for Kathleen's third Chloe Ellefson mystery, The Light Keeper's Legacy. Yesterday demand for the first and the last of Kathleen's nine American Girl Caroline books boosted them into the Top 1% of all US printed book sales, out of 8 million books tracked. Kathleen reports that today was the most productive day so far of her retreat, thanks to the help of her writing companion—Sophie the Super Muse. They are away this week at an undisclosed location, working on Chloe Ellefson mystery #7 for release in fall 2016. Kathleen and Sophie her feline muse will be away this week at an undisclosed location. Their initial focus will be finishing final edits to the sixth Chloe Ellefson mystery, Death on the Prairie, set for release early this October. After that they will be on working on the manuscript of the seventh Chloe mystery—as yet unnamed—for release in the fall of 2016. 'Mr. Ernst' will remain behind, keeping the home office open. Yesterday demand for Kathleen's American Girl books boosted a trio of them into the Top 1% of all US printed book sales, out of 8 million books tracked. Source: Nielsen BookScan. This Tuesday, June 9th, Kathleen will present her popular American Girl Fans and Chloe Ellefson Mysteries illustrated programs at the public library in Red Wing, MN. From 3-4 PM she will share how she created Caroline and wrote 19 books for American Girl—and the library will raffle off a Caroline doll. Then from 5-6 PM she will discuss her award-winning Midwest-based Chloe Ellefson mysteries—including a 'sneak peek' into the sixth book. All's well once again at the Pottawatomie Lighthouse on Rock Island! Free, public tours of the building have now resumed. The building had been temporarilly closed due to construction of a new water well to replace its 105 year old well. The lighthouse, Rock Island, and nearby Washington Island are the settings for key scenes in Kathleen's 3rd Chloe Ellefson mystery, The Light Keeper's Legacy. Released at the end of February, Kathleen's nineteen American Girl historical fiction novel, The Smuggler's Secrets: A Caroline Mystery, has now been ranked in the Top 1% of US printed book sales—out of 8 million books tracked—for 100 days (pre- and post-release). Source: Nielsen BookScan. Drilling the new water well at the lighthouse is now finished, and the trucks have departed. This photo by Melody Walsh of the Friends of Rock Island shows the tall pole for the solar panel(s) that will power the new well pump and the capped well to the right of the pole. The lighthouse remains closed to the public, but is expected to reopen soon. Released last August, Kathleen's American Girl book, Facing The Enemy: A Caroline Classic Volume 2, has now been ranked in the Top 1% of US printed book sales—out of over 8 million books tracked—for over 100 days (Source: Nielsen BookScan). This volume contains three wonderful stories previously available as separate, now out-of-print books: Caroline Takes A Chance, Caroline's Battle, and Changes For Caroline. 10 Book Giveaway - The Winners! Congratulations to the lucky winners of Kathleen's first Summer Reading 10 Book Giveaway: Amanda Acklan, Stacie Amelotte, Christie Berthold, Daria Bacon, Kay Eisenreich, Deb Forbes, Judy Goodnight, Barbara A. Hesprich, Kathy Bullard Stach, and Kiki Winn. Each will get to pick one of Kathleen's 31 titles and receive a free, signed and personalized copy! 10 Book Giveaway - Today! It's the summer reading season! To help kick it off, Kathleen is giving away ten free books! To enter, leave a comment on her Facebook Author page or Sites and Stories blog before Midnight tonight, Tuesday, June 2nd. One entry per person limit. Ten winners will be randomly selected and announced tomorrow. Each will get to pick one of Kathleen's 31 titles and receive a free, signed and personalized copy. Good Luck to everyone! Kathleen's thirty-second published book is a work of non-fiction that offers "a rare glimpse into the lives of early immigrants to the upper Midwest." The book is richly illustrated with photos of Old World Wisconsin by Loyd Heath. Printed copies can now be pre-ordered from Amazon, Barnes & Noble, and its publisher, the Wisconsin Historical Society Press. Based on reports and photos by Meloday Walsh of the Friends of Rock Island (FORI), drilling a new water well are finally making progress after strenuous efforts to get the trucks to the lighthouse and retrieve/replace a broken drill bit. The new one will replace the existing handpump-powered 100-year old well. The lighthouse continues to be closed to the public while construction is underway. On Saturday demand for Kathleen's mysteries boosted a pair of them into the Top 1% of all US printed book sales, out of 8 million books tracked by Nielsen BookScan, a sales tracking service widely used by the publishing industry. Kathleen will be giving public tours of the lighthouse on Rock Island this Memorial Day weekend, as previously announced. However, starting this Tuesday, May 26th, the building and grounds will be closed to the public for the rest of the week for construction of a new water well. That work had been scheduled for the following week, but was advanced without Kathleen being notified. We sincerely apologize for any inconvience this may cause. Kathleen's fifth Chloe Ellefson mystery book, Tradition of Deceit, (released last November) has now been ranked in the Top 1% of US printed book sales—out of 8 million books tracked—for 125 days. Source: Nielsen BookScan, a publishing industry tracking service. Chloe 6 - Sneak Peek Preview - This Sunday! Kathleen's American Girl book Secrets In The Hills: A Josefina Mystery (shown with its new Beforever cover) has now been ranked in the Top 1% of US printed book sales—out of 8 million books tracked—for 250 days since it came out in 2006. Source: Nielsen BookScan. Recently American Girl said they plan to "archive" their Caroline Abbott War of 1812 historic character "soon." This means they will stop advertising and selling the Caroline doll, accessories, and the nine books Kathleen wrote about her. Today Kathleen sent her mailing list an email with her response to this news. You can read it by clicking HERE. American Girl: "Farewell to Caroline"
Kathleen joined other Midnight Ink mystery authors and editor Terri Bischoff to host the Friday evening reception at this weekend's Malice Domestic Mystery Fans Convention in Bethesda, MD. Midnight Ink, which publishes Kathleen's award-winning Chloe Ellefson mystery series, sponsored the event in honor of the 10th anniversay of its founding. Released at the end of February, Kathleen's nineteen American Girl historical fiction novel, The Smuggler's Secrets: A Caroline Mystery, has now been ranked in the Top 1% of US printed book sales—out of 8 million books tracked—for 75 days (pre- and post-release). Source: Nielsen BookScan. Meet Me in Menasha & Little Chute! On Monday, April 20th, Kathleen will be in Wisconsin's Fox Valley presenting her popular illustrated American Girl Fans and Chloe Ellefson Mysteries programs at the Fox Cities Book Festival. From 4:30-5:30 PM Kathleen will be at the Menasha Public Library talking about how she researched and wrote 19 books for American Girl. From 6:30-7:30 PM she'll be at the Little Chute Public Library discussing her award-winning, Wisconsin-based Chloe Ellefson series for adults. Released last August, Kathleen's previous Caroline American Girl book, Catch the Wind, has now been ranked in the Top 1% of US printed book sales—out of 8 million books tracked—for over 150 days (pre- and post-release). Source: Nielsen BookScan. The Smuggler's Secrets, the newest Caroline American Girl mystery, is now available as an eBook for reading with Barnes & Noble Nook apps and e-readers. Released at the very end of February, Kathleen's ninth Caroline Abbott American Girl book, The Smuggler's Secrets, has now been ranked in the Top 1% of US printed book sales—out of 8 million books tracked—for 50 days (pre- and post-release). Source: Nielsen BookScan. While working on Tradition of Deceit Kathleen collected a lot of old, award-winning baking recipes. Now she'd like to share the best ones on her blog, but doesn't have the time to test them beforehand. So...Kathleen is inviting those who would enjoy trying an old recipe to use her website Contact Form to express their interest and get more information. Today Kathleen is visiting the Village of Eagle Police Department to learn more about police work by riding on patrol with an officer. Roelke McKenna, a main character in Kathleen's award-winning Chloe Ellefson mystery series, works for the EPD. The Wisconsin State Rosemaling Association has invited Kathleen to give her Chloe Ellefson Mystery program to their Spring Meeting. It begins today at 1:30 PM in the Stoughton Fire Department Training Room and is free and open to the public. In addition to her program, Kathleen will be answering questions, awarding door prizes, and selling and signing her Chloe Ellefson and American Girl books. The winner of Kathleen's "31 Books for 1 Lucky Reader" giveaway is Kerry Scott of Albuquerque NM, who gets a signed copy of every one of Kathleen's 31 published books! Today Kathleen is holding a gigantic giveaway to celebrate the publication of her 31st book, The Smuggler's Secrets: A Caroline Mystery. One lucky reader will win new, signed, print copies of each and every one of Kathleen 31 published books. To enter, leave a comment on her Facebook Author page or her Sites and Stories blog before Midnight tonight! Yesterday demand for Kathleen's Caroline American Girl books boosted three of them into the Top 1% of all US printed book sales, out of 8 million books tracked by Nielsen BookScan. Listen to Kathleen being interviewed by bestselling Chicago author Libby Fischer Hellmann, who proclaims her "the treasure of Wisconsin." Click on the right-facing triangle below to start the podcast. A discussion guide written by Kathleen is now available for her new Chloe Ellefson mystery, Tradition of Deceit. The guide is intended to help book groups spark inspired discussions. To download a free PDF copy, click HERE. Demand for Kathleen's American Girl Caroline books boosted three of them into the Top 1% of all US printed book sales today, out of 8 million books tracked by Nielsen BookScan! Kathleen is away for the week to begin working on her seventh Chloe Ellefson mystery book, for release next year. (Chloe 6, Death on the Prairie, is set for release in October, 2015.) Kathleen's long-time feline companion and muse, Sophie the talking Torby, is away with her. 'Mr. Ernst' has remained behind to keep the home office open. Congratulations to the lucky winners of yesterday's third and final Ten Book Tuesday Giveaway: Dianne Bahn, Barb Berner, Brit Thornburgh Brill, Jane Lepeska Grinde, Karla Lawrence, Clara Martin, Elaine McPherson, Ginny Pfinder, Patty Putnam, and Patsy Rossman. Over the last three Tuesdays Kathleen has given away 31 books to thank readers in honor of the upcoming release of her 31st published book, The Smuggler's Secrets. Congratulations to the ten winners of yesterday's Ten Book Tuesday Giveaway: Callie Barrett, Lynn Buckingham, Gail Burges, Carole Dagg, Aurora Elann Froncek, Becky Lurvey, Vicki Sandberg, Leslie Powell Schell, Cindy Stewart, and Caroline Vuyadinov. The next Giveaway will be held Tuesday, February 17th. Check either Kathleen's Facebook Author page or her Sites and Stories blog on that date for details. Demand for Kathleen's American Girl books boosted three of them into the Top 1% of all US printed book sales today, out of 8 million books tracked by Nielsen BookScan! Kathleen has just received a 2014 All Star Award for email marketing effectiveness from Constant Contact, a marketing company serving small businesses and non-profits. This is the third consecutive year that Kathleen has earned this honor. Just six percent of the company's half million customers are multi-year All Star Award recipients. Congratulations to the winners of yesterday's Ten Book Tuesday Giveaway: Kathryn Atchison, Nancy Hill Bradford, Elizabeth Dusik, Zoe Gillman, Ruthi Henrichs, Candace Wolfenbarger Knight, Ulrika Ritzen Kristensson, Debbie Moore, Melinda Murphy, and Marilyn Sieb. The next Giveaway will be held Tuesday, February 10th. Watch Kathleen's Facebook Author page or Sites and Stories blog for details. February 28th is the official release date for Kathleen's seventeenth book from American Girl, The Smuggler's Secrets: A Caroline Mystery. Between now and then Kathleen will be holding a series of exciting giveaways, the details of which will be announced shortly. The Gudrid Reading Circle of Madison, Wisconsin has been in continuous existence since the late 19th century, and Kathleen was the speaker at the group's annual guest meeting today. Gudrid membership is limited to 25 women, age 50 and older, who have close ties to Scandinavia. Kathleen discussed the Norwegian-American roots of her Chloe Ellefson character and the Scandinavian influences in her mystery series of that name. A 'Sneak Peek' about Kathleen's new Caroline American Girl book, her upcoming non-fiction history, and her next Chloe Ellefson mystery are all covered in her just released Winter Newsletter. To read it, cick HERE. The newest Chloe Ellefson Historic Sites mystery, Tradition of Deceit, has just been named as one of the 15 Best Reads of 2014. It was chosen from the 200 mysteries read last year by the author of the popular (over 90 million visits and counting) Escape With Dollycas Into A Good Book blog.